Living rooms by top designers may look stunning on Pinterest, but not many people can actually have a functional life while living in those spaces. Real life requires kid-proof, stain-resistant, and comfortable elements that make you want to be in your home without sacrificing style. The good news is that smart engineers and designers have created elements in our modern day that can support your lifestyle while complementing your style. Here are a few ideas for creating a beautiful living room you can actually live in. The joke comes up in many movies and television shows: the man of the house has that comfortable, well-worn armchair for watching TV and drinking beer, and it’s an eyesore for his wife and the viewers alike. He doesn't want to get rid of it, because it’s comforting, so there it sits in the middle of the living room, and not even a slipcover will mask its intrusive ugliness. It’s time to invest in a chair that is both comfortable and stylish. Contrary to what the man in your life might think, these options do exist, and they’re wonderful. 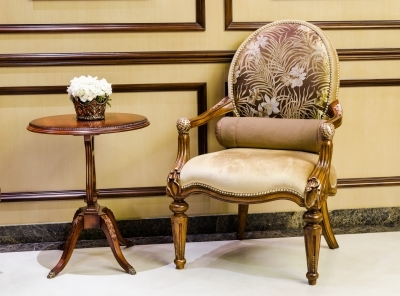 Do a bit of online research to find a chair you can compromise on. Grab a few matching decorative pillows that are easy to clean and will add a few pops of color to the armchair. Set up some elements around it that will encourage your husband’s comfort and please your guests’ eyes. A small end table next to the arm chair with clean lines and a drawer will give him a place to hide away the TV remotes. Paint is one of the most inexpensive and dramatically-altering elements you can change in a room. Go for a consistent color scheme in colors you love. Warm tones will add comfort to a space. Consider painting an accent wall in a bright, bold color to add a splash of style. Choose paints with a gloss, which are washable in case your little ones decide to touch the walls with dirty hands or find a new coloring space. Keep some extra paint on hand in case unsightly knicks happen, and touch up those spots every once-in-a-while. Your artwork is the perfect place to add some style. If you have small children, implement lots of mirrors and wall art, since these items will be hung high out of children’s reach and can’t be knocked over like collectibles. Do some online searches to determine what type of style appeals to you most, and purchase and frame some prints that exemplify that style and your color scheme. Paige One looks forward to writing about a variety of subjects, from fashion to interior design.